A new technology has been developed by a Swiss start-up that mimics complex systems in nature to create fully autonomous power grids anywhere in the world. Using a technology called Swarm Power, Power-Blox allows anyone to create a ‘plug-and-power’ energy grid that is completely autonomous, scalable, and decentralised, while requiring no management, configuration or maintenance. The system is regarded as a major breakthrough in energy technology because anyone can create a Swarm Grid to power a school, hospital or an entire town simply by adding additional Power-Blox to the system. Swarm technology is based upon nature’s approach towards organising complex structures in a fully decentralised way. In a swarm, the most complex systems are governed by a simple set of rules that are acted upon without the need for centralised decision making. As the individual entities within the swarm follow this set of rules they interact with one another without knowledge of the swarm’s behaviour, giving rise to an ‘intelligent’ global behaviour for the entire system. Power-Blox has taken this concept and applied it to a power grid. With Swarm Power, the power generation, storage and distribution are done with a fully decentralised architecture to manage fluctuating current, as opposed to a smart grid which needs a centralised architecture. The energy in the swarm is stored in nodes and every component of the grid learns how to adapt to the current state of the grid by observing the grid parameters and adapting its behaviour with the use of Artificial Intelligence (AI). The Power-Blox 200 series are individual, intelligent energy cubes with an integrated battery. Each cube provides 200W of alternating current and can provide power for lighting, one refrigerator, a television and mobile phone/laptop charging. The cubes can be powered by an optionally provided solar unit or from any external source (such as solar, wind, hydrothermal, biomass or a generator etc). Power-Blox acts as a universal energy interface and can be combined with any external energy source or storage device. When a minimum of two Power-Blox are combined, proprietary algorithms enable the system to adapt and react with swarm intelligence, creating a Swarm Grid that can provide sustainable and regulated power for schools, hospitals, telecommunications infrastructure, agricultural equipment, remote tourist resorts, events/festivals, disaster relief, and up to entire villages and towns. The scalability of Power-Blox is essentially limitless due to the modular architecture of the system. Anyone can scale energy storage and production by simply incorporating additional units into the system as energy requirements increase. Additionally, the cubes are completely ‘plug-and-power’ and don’t require any special configuration, engineering or expertise when adding additional modules to the system. In developing countries, nearly $27bn is spent annually on lighting and mobile phone charging technologies with a $3.1bn market opportunity for the off-grid solar industry by 2020, according to Bloomberg’s Off-Grid Solar Market Trends Report 2016. In industrialised countries, the off-grid market will be a $23bn opportunity by 2024. Solar home systems have a small power range, a short service life and cannot be expanded. Diesel generators create strong pollution and dependencies for fuel supply with high operation costs. Micro-grid systems present high initial costs, limited opportunities for expansion and need complex engineering and installation. Additionally, a failure of a critical component in any of these systems will shut down the whole grid. 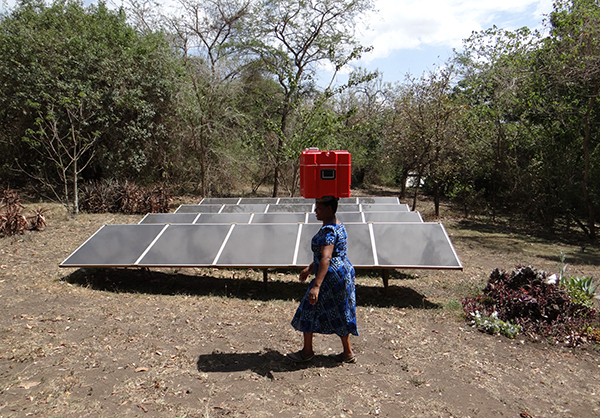 Power-Blox has been awarded the Axpo Energy Award 2014, the UN National Energy Globe Award of Tanzania 2015, and is a top ten Finalist for the InterSolar 2017 Award next month in Munich.